6th Energy’s Diesel Management System is designed to work with any Diesel Generator to monitor and provide real-time information on KPIs such as fuel consumption, DG run hours, fuel refills, DG health, and DG battery voltage. Our proprietary algorithms are designed for automated diesel monitoring and accounting to eliminate variables such as diesel tank shapes and sizes, temperature variations, etc., to provide maximum accuracy in measurements. 6th Energy Generator Monitoring- How does it work? power generated, battery voltage, run hours, fuel level, etc. A gateway device then communicates these readings to our central server over the internet. The sensors monitoring the Genset works on GPRS, 3G/4G wireless or Ethernet technology. You can log onto the 6th Energy web application (or) Mobile App & view generator parameters, create reports, anywhere and any time. All reports include generator status, fuel and maintenance reports etc. 6th Energy’s solution comprises of smart sensors based on hydrostatic/capacitive measurement principle that communicate accurate information to our IoT gateway. 6th Energy’s Internet of Things (IoT) gateways act as conduits between the sensors and the 6E Cloud. They have built-in advanced machine learning algorithms that enable control of equipment. In addition, transport redundancy can be enabled in various configurations with a combination of cellular and Ethernet network, with either one as primary and backup network. Data from the gateways is sent up to the 6E cloud. The cloud is designed for hyperscalability and AI/ML support – which means that it can operate systems ranging from tens to tens of thousands of installations with the same real-time performance. In most typical operations, the assets are distributed across large areas spanning thousands of kilometers, covering urban and remote areas. It is impossible to monitor each site individually without significant number of feet on the ground. Even with that, information is prone to errors and inaccuracies. A remote monitoring system simply monitors equipment 24×7 across multiple locations addressing this challenge. 6th Energy’s Data Explorer analytics system continuously works on the information from the remote site, recognizes anomalies, and flags them with actionable insights into potential causes and recommendations on corrective action. 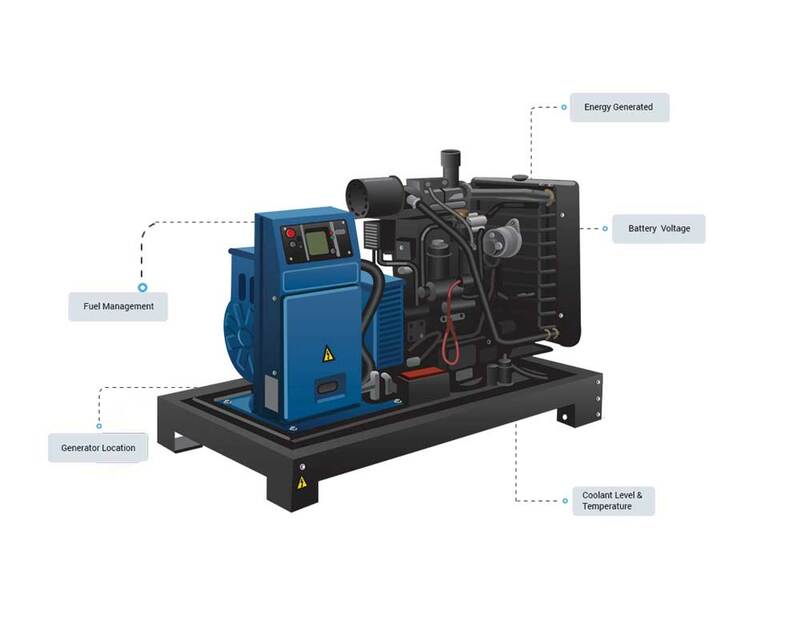 Manage thousands of generators on a single platform. IoT Enabled Remote Battery Monitoring Systems & Sensors! 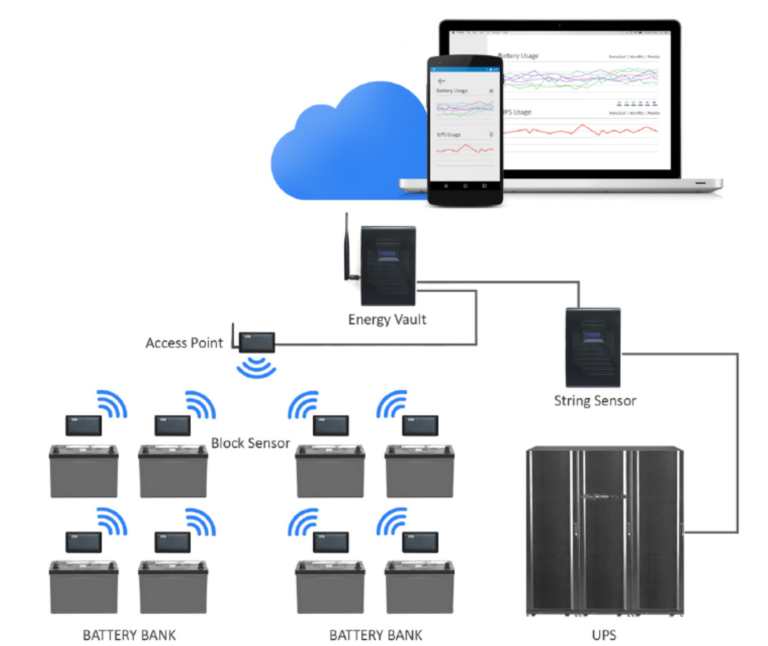 6th Energy’s battery health monitoring system is used to monitor various parameters like battery voltage, cell temperature— anytime and from anywhere. All businesses today require a constant supply of electricity. With the exception of a few regions, grid reliability is a major issue world over. When grid power becomes unavailable, it is up to the auxiliary systems like UPS’ to ensure operational continuity. Batteries are the lifeline of auxiliary power systems and also the most susceptible to failure. Having inefficient or defective batteries, is as good as not having a backup system. Battery Monitoring Solutions (BMS) ensure that the system is proactively maintained and fault free. Advancements in battery technology and management techniques have been reactive rather than proactive. Advanced capabilities such as software management, and intelligence built into batteries have reduced the failure risks inherent in batteries. An integrated UPS and battery monitoring solution monitors both the UPS and batteries 24x7x365, correlates data between the two to identify root cause for failures and enables necessary actions to prevent them proactively. With the advent of the Internet of Things technology, equipment is going from smart to intelligent. This means, every device that has internet enablement is not just pushing data to the cloud, but it is intelligently processing this data to generate actionable insights. These insights can be used to make real-time, critical, and informed decisions. Leveraging the unique benefits of IoT to achieve the goals of battery monitoring is exactly what 6E Technology aims to do. 6th Energy’s energy management architecture follows an “all-digital”, smart-sensing, and control approach at site with all the sensors, meters, and actuators being digital in nature. In typical modern operations, the assets are distributed across multiple facilities, covering urban and remote areas. It is impossible to monitor each site individually without significant number of feet on the ground. Even with that, information is prone to errors and inaccuracies. A remote monitoring system simply monitors equipment 24×7 across multiple locations removing human errors in the process. Data from the gateways is sent up to the 6E cloud. The cloud is designed for hyperscalability with statistical/CV/AI/ML support – which means that it can operate systems ranging from tens to tens of thousands of installations with the same near real-time performance. 6th Energy’s Data Explorer analytics system continuously works on the information from the remote site, recognizes anomalies, and flags them with actionable insights into potential causes, and recommendations on corrective action. 6th Energy’s solution for integrated UPS & battery management truly ensures complete real-time management while enabling preventive and proactive maintenance of equipment. Remote monitoring and SLA management in Telecom towers! are prevented or avoided. This is easier said than done, because of a large number of dependencies. However, ensuring these things are in check, adds to the bottom line and reduces operating expenses. How Can Remote Tower Management System Help? Remote Tower Management Systems have IoT enabled sensors, & smart devices, installed at the Telecom Site, that monitor various parameters such as energy utilization, battery voltage, run hours, generator fuel level, temperature sensors at the cell tower, etc. A gateway device then communicates these readings to central server over the internet. The sensors that monitor the Cell Tower communicate using wireless technologies like GPRS, 3G/4G, standard WiFi or Ethernet technology. In typical telecom operations, the assets are distributed across large areas spanning thousands of kilometers, covering urban and remote areas. It is impossible to monitor each site individually without a significant number of feet on the ground. Even with that, the available information is prone to errors and inaccuracies. A remote monitoring system simply monitors equipment 24×7 across multiple locations addressing this challenge. 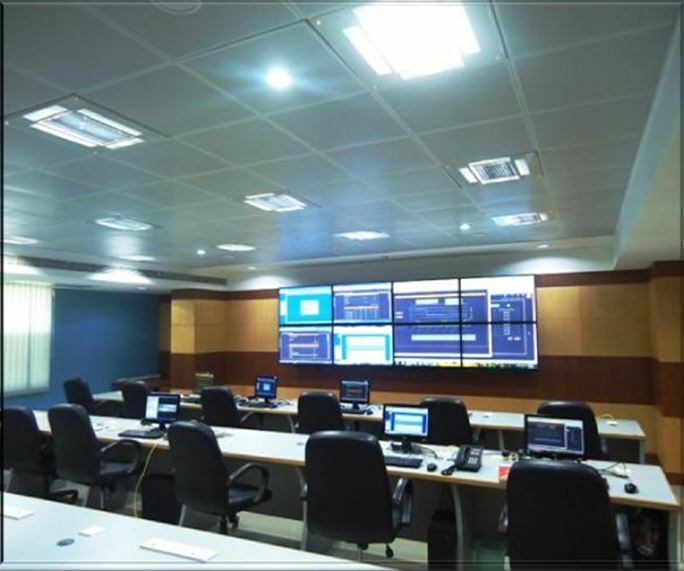 6th Energy’s solution for Remote Infrastructure Management, along with smart asset monitoring, is based on state of the art IoT advancements and security which ensures that the equipment is secured and monitored 24x7x365. Multiple users can manage the system simultaneously across different platforms in real-time. Data is stored in our hyper-scalable cloud, which means there are no limitations on its availability. We are a full-stack solution, which means, everything from the sensors, gateways, cloud, web interface, APPs, and analytics is designed and built in-house. We collect rich IoT data and use advanced statistical/AI/ML analytics algorithms to transform it into actionable intelligent insights. 6th Energy’s cell tower IoT gateways act as conduits between the sensors and the 6E Cloud. They have built-in advanced machine learning algorithms that enable control of equipment. 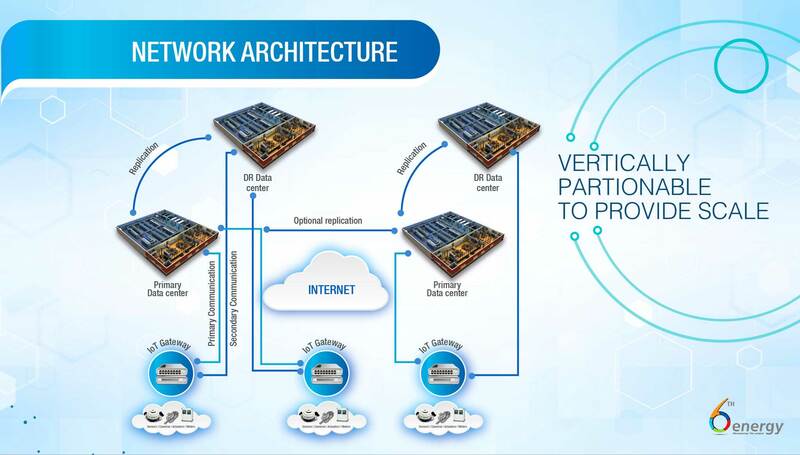 In addition, transport redundancy can be enabled in various configurations with a combination of cellular and Ethernet network as primary and backup network, and vice versa. Data from the IoT gateways is sent up to the 6E data cloud. The cloud is designed for hyperscalability and statistical/AI/ML support – which means that it can operate systems ranging from tens to tens of thousands of installation with the same real-time performance. 6th Energy’s Data Explorer analytics system continuously works on the information from the Telecom Site, recognizes anomalies, and flags them with actionable insights into potential causes and recommendations on corrective action. 6th Energy’s IoT solution for Remote Telecom Site Monitoring truly ensures complete real-time management of equipment, energy, environment, fire safety & security.